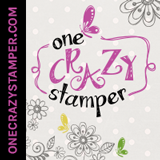 Lora's Crazystamper Blog: Ready for Mother's Day! Well it's true I'm all ready for Mother's Day well at least the card is anyway. I made this one for my Mom and I chose this Stampingbella image called Uptown girl Maybelline loves Mail because my Mom just loves happy mail. I coloured the image first on just a big piece of Xpress It because I wasn't too sure what I was going to do with the card design. Then things changed when the new Spellbinders arrived...oh how I love the Elegant Ovals. So parts of my image where cut off when I cut it out with the die, but I really liked how it looked. This card is 5" x 6 1/2" (cardstock size 10" x 6 1/2"). I wanted to keep the card simple so I went with no patterned paper and used an lovely Cuttlebug embossing folder instead. Love your card Lora .